Remember the last time you looked for a restaurant in a strange town? Did you check the reviews? Sadly, we’re often more motivated to leave a bad review than a good one. People appreciate reviews, but need a good balance to make sensible decisions. Even a bad bad review is good. 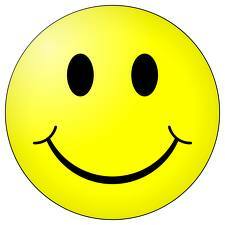 It’s an opportunity for the business to improve and to make a conciliatory offer to regain your goodwill. When Did You Last Leave One? And then forgot all about it? It can take as little as 10 seconds and just leave a star rating. If you have a little more time, write a few words, of praise or criticism. If you took a photo, so much the better. A picture’s worth a thousand words. Then, top left, start typing the name of the business you want to review. Google will start listing local businesses as you type. Select the one you want from the list when you see it there. Click on an appropriate star (right-most means five stars :o) to indicate your star rating. If you decide to write something in the “Describe your experience” box, don’t forget to say how you benefited. 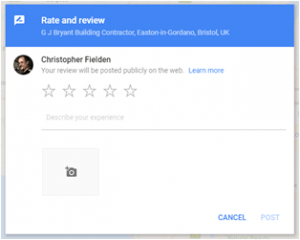 This entry was posted in Digital Marketing and tagged google, maps, reviews on April 27, 2017 by Dave Fielden. Over 50% of people now search on mobile devices, so no-one can afford to ignore this issue. Even some apparently mobile-friendly websites fail these tests. Is yours one of them? Google and Bing take this very seriously. Seriously enough to provide simple tools for you to check your website. 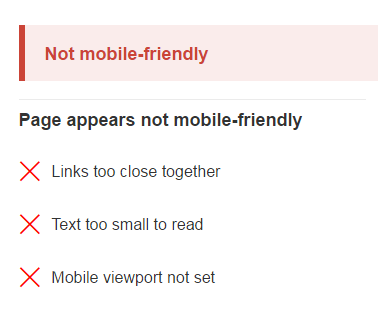 Google’s recent update penalises websites that aren’t mobile friendly. For searchers using using a smartphone or tablet, it will reduce your page rank. If your landing pages aren’t mobile-friendly, it may stop displaying your ads on mobiles. Take five minutes and use these three simple tools to check if your website is losing business for you. Best of all, they’re free! Here’s Google’s mobile friendly web page testing tool. Your web page must pass this test. However, I have seen false positive results, so use tool number three, too. Google also helps fund the Web Page Speed Test, at www.webpagetest.org. Your web page should become visible within four or five seconds, tops. You’ll lose viewers – and potential customers – if it doesn’t. Tool 3 is your own Common Sense: take a look at your web page on a smartphone – but maybe not your own! Explained below. Have a go now. If you have any questions, I’ve added explanations below. Neither of the first two tests is definitive, so make sure you use the third as well. The speed test needs a little thought, so maybe read that bit, even if you don’t read the rest. Type your home page URL into this Google tool, click Analyze, and wait a few minutes for it to check your site. You’ll see your page in a mobile phone, like this, if your page is mobile friendly, or “Awesome”, as Google describes it. 2double7 is a local taxi firm and they have a BlueTree website. 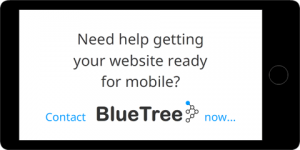 All BlueTree sites (well, those less than a few years old) are mobile friendly. We take steps to make sure of it during the build process. Try 2double7’s by copy/pasting this URL into the tool www.2double7.co.uk. If want to you try ours, remember it’s encrypted (that’s another story) so you may need to enter the whole URL, https://www.bluetree.co.uk. If your website isn’t mobile friendly, you’ll get a different result. I picked a local, Portishead, non-mobile-friendly website at random. I won’t say who’s it is :o). Suffice to say, it’s not a BlueTree site. If you use a CMS, you could maybe help by making the text bigger. However, if you get a result like this, you need to talk to your web designer pretty soon if you want to stop losing 50% or more of your visitors. Since writing this post, Google has published more evidence of how slow mobile downloads impact usability and viewer satisfaction. This is the web page speed test tool. Here are a few things to think about before using it. Test Location. Select a server near where your website is hosted. For us that’s UK, and any UK selection will do. You may find your website is hosted overseas somewhere, so check with your ISP. If it’s hosted outside the UK, the page download speed will be slower. Even though bits and bytes travel at the speed of light, the further away your host is, the more switching computers there are between you and your visitors. Update: I’ve since noticed that, sometimes, no UK test centres are listed. If this happens, just chose the nearest, or try again in a few days time. Location makes a difference, but only a small one. Select Browser. The browser choice affects the speed with which your page is “rendered” so it makes a small difference. Bear in mind that phones work at about one third the speed of a recent laptop, so the structure and coding of your web page are much more important than the browser you select. Next click on Advanced Settings. Connection. This is the speed of Internet access that’ll be used for your test. The slowest UK mobile phone service is 3G. Speed varies with provider, device, and signal strength. Even if your own connection is faster, select one of the 3G connections to see what your average visitor will see. Number of tests to run. Results vary, so we need to run several to get a fair reading. Choose an odd number, because the tool selects the median value, or middle result. You need an odd number to get one of them in the middle. The more runs, the more representative the result. The maximum is 9 in the free version. Repeat view. Web browsers store web pages locally to speed up repeat views. This avoids having to load pages again if a visitor comes back, saving time and bandwidth. I usually check “first view only” as this is the test that represents a first-time visitor. If a visitor returns, they must want something, so they’ll wait longer anyway. Capture video. Check this box to see a movie of your web page loading. It’s worth looking at the video. One site I checked showed a load speed in excess of 25 seconds, but it began to display after six. Keep test private. The website keeps all results for a while, so you, and others can see them. Check this box if you don’t want your results public. You can still see them. Label is optional. It allows you to identify a particular test later. Take a look at the test history tab when you’re through, and you’ll see the reason for it. Now click the yellow START TEST button. Your test may be queued and you’ll see how many there are in front of yours. The test will take a while, and the screen will refresh after each iteration. You don’t need to watch it, just keep your browser open while you’re doing something else. To keep your visitors happiest, the “Start Render” time should be less than four or five seconds. That’s when things start to happen in earnest, and your visitor sees something. This is 2double7’s result. The start render time is just over three seconds, whilst the whole page loads in just under six. For 3G, that’s very good for any page, especially good for a big page like this. A red or orange box, top right, shows improvements your web designer can make. Green A is perfect, F is fail. If you select a slow connection, such as Slow 3G, the First Byte Time may be orange or red. This is because it includes the time to make first contact with the server. It depends, in part, on the speed of your network. All you or your web designer can do about it is to choose a good ISP to host your site, and locate it in the UK. Your web designer can set HTTP Keep Alive, which maintains the connection, once made, for the page load duration. It should be green A. Every time the connection breaks, your visitors’ browsers must incur the First Byte Time again. Compress Transfer is a server-side setting, and WebPageTest.org doesn’t always notice it. If your page has a red F here, check it again using this HTTP Compression Tester, also free. If that reports all Ok, then it is OK.
BlueTree CMS does Compress Images automatically when you upload them, so they can’t be compressed any further. You may still trigger the dreaded red F. It’s worth asking your webmaster (BlueTree included) if you don’t get a green A here. On a BlueTree website, Cache Static Content will usually show the red F, By caching content locally, your visitor will see your web page faster on subsequent visits. Problem is, should you update your page, something that’s easy and frequent with BlueTree CMS, your visitor will see the old version and not the update. Lets’s face it, who ever thinks to refresh their cache? Your pages should load so fast that you don’t need to worry about caching them. The X, to the right, indicates the site doesn’t use CDN, or a Content Delivery Network. Multinational organisations ensure fast delivery by using servers located in each country. Remember earlier, when you chose the country in which your website is hosted? 2double7 serves a local market, so they don’t need to worry about this. There’s no CDN code on 2double7’s website. Go to the median run (it was run 5 for this example) and click on “Watch video” to see what a real visitor will see. Download the video to send to your web designer if you’re not 100% happy. Look at your web page on a mobile phone. It sounds dead obvious but do it anyway, and borrow other people’s phones. Beware of caching. Web browsers keep a local copy of recently-viewed pages in a “Cache”. Next time you visit, the page is displayed more quickly, from the cache. This why the speed test offers first and repeat view options. To get a true result for a first-time visitor, ignore the first result and refresh the page. Or ask friends to look on their phones, so long as they haven’t looked at your website before. You may get a false positive result from the mobile-friendly test. The tool rated this site mobile-friendly, but only checked the Cookie warning. This page isn’t mobile friendly. If a big photograph occupies the top half of your page, that’s all you’ll see on a smartphone. Not everyone will bother to scroll down to your your message. Some web pages contain movies, or cycling photographs, at the top of the page. These look very nice on a laptop, but may be all your visitors see on mobile. How many will wait around to see the whole show and get your message? Send the movie your website designer and ask for a quote. Or, if you’d like to change to a BlueTree website, get in touch, or leave a comment below. Our ethical pricing policy means you may find it costs less than fixing your current one! This entry was posted in Website design and usability and tagged google, mobile-friendly, website design on June 30, 2016 by Dave Fielden. Well, from time to time I Google, “search engines” just to see what comes up. There are quite a few. More than you might imagine. Though it may take a while, the influence of mighty companies always wanes. It only takes one new upstart to grab the world’s attention and the market leader starts to make mistakes. Maybe this is Google’s nemesis, maybe not. What if there were a new search engine that doesn’t harvest my on-line life for commercial gain? One that’s simple, clean, and it doesn’t tell me I’m missing out by not being logged in to my account? Just like Google used to be, in fact. Top of my search results was an engine called DuckDuckGo. That’s impressive too, as it proves Google really does try to give users the best results it can. DuckDuckGo is, after all, Google’s competitor, albeit a small one. DuckDuckGo’s most obvious feature is that it doesn’t recognise you, remember you, store information about you, nor tailor search results for you. Every user making the same query gets the same results. Google delivers different search results depending on location, device you’re using, and whether you’re logged in to your Google account. Next is the way it works. DuckDuckGo doesn’t crawl the entire worldwide web in the way other search engines do. Instead, it uses developers’ interfaces to other search engines, along with publicly available information from sites like Wikipedia. Altogether it has around 50 sources, which it filters and sorts using its own algorithms. It’s a bit simpler than Google and it seems to work quite well. Read all about DuckDuckGo on Wikipedia. It’s in the news right now because Apple iOS 8 now offers DuckDuckGo as an alternative search engine. To compare its results with Google, I tried a couple of searches. Not a great test, but since I wanted to do these searches anyway it seemed a good idea. I used the Firefox web browser, so they were both on the same footing. Our electric kettle at home has broken and we need a new one. The best buy in Which? is the Dualit 72400, so I searched for that. This product is available worldwide and its has a relatively long lifespan. As you can see, Google displayed three ads at the top this time, then the real search results. It doesn’t display the same ads, nor even the same number, every time. 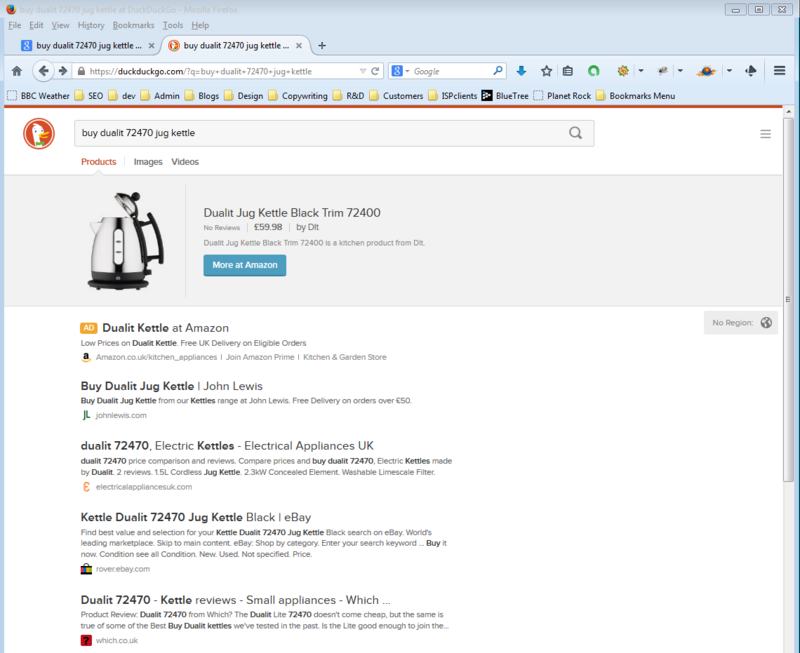 I used google.co.uk, so it knows I want to buy my kettle in the UK, even though I’m not logged into my Google account. It’s just given me UK-based web pages. Here are the DuckDuckGo results. Two ads from DuckDuckGo and then the first result is the same as Google’s. Both also have the Which? website at position four. However, DuckDuckGo included some .com results, which aren’t much use to me. Google does this quite often, too, which is irritating, and it’s easier to convince DuckDuckGo that you want to search UK sites only. Top right on DuckDuckGo’s search results page is a region selector button. One click sets it. This takes three clicks on Google and it doesn’t always offer the option, so then you’re forced to add “UK” to your search query – too many keystrokes :-(. How to convince Google you only want to see UK sites. 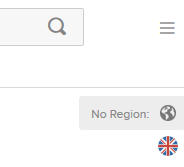 Click Search tools > Any country > Country: the UK. They used to let you do this before searching. Can’t imagine why they changed it. I want to buy some tickets for what promises to be a very entertaining show at the Tobacco Factory in Bristol, “Elizabeth I: Virgin on the Ridiculous”, performed by “Living Spit”. We saw another of their productions in Portishead in June and it was very funny indeed. This seems a good test because I’m looking for something that is a) local, and b) has a short lifespan. Here are the top four results from Google. 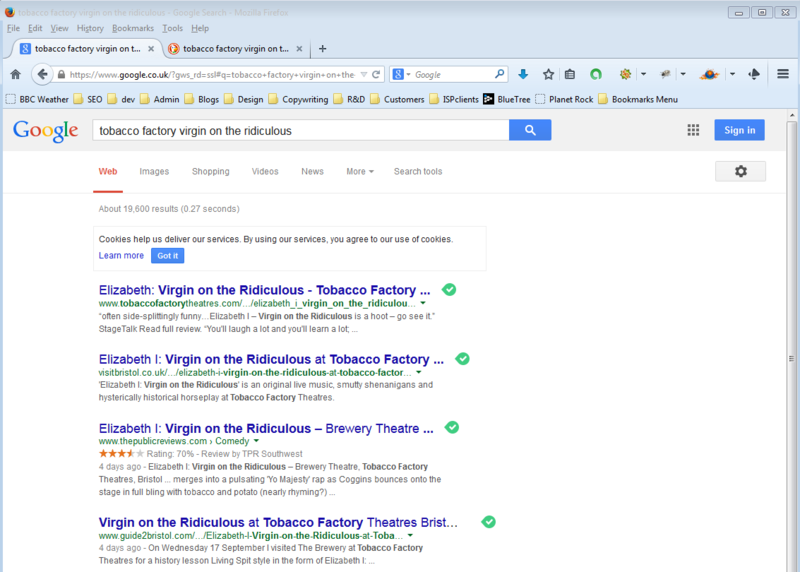 They both have the Tobacco Factory website first and one other in common: Visit Bristol. The other results from both are equally useful. 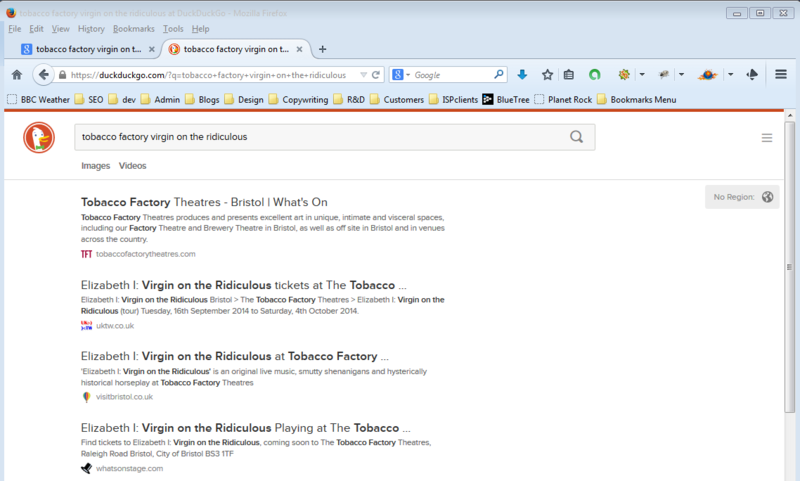 Fom this very limited test, it looks as though DuckDuckGo may be a usable search engine, despite being relatively new. Its ethos is quite different from Google’s: it’s not out to make lots of money. It’s worthy of further investigation. I’m going to continue using Google in my Chrome browser, which is permanently logged into my Google account. This always tailors search results specifically for me: it knows my age and gender, where I live, what I search for, my favourite travel destinations, the things I buy, my circle of friends and same things about them. Think how Google can influence my search results – and the way those very results influence what I do. Interesting! Useful too, until (if ever) that influence is misused. I use Firefox for development and research and I’m switching to DuckDuckGo for that. And I’ll definitely use it in Avast SafeZone, when I search for websites where I’m going to enter credit card or bank details. If you’ve tried DuckDuckGo, we’d really like to know what you think of it! 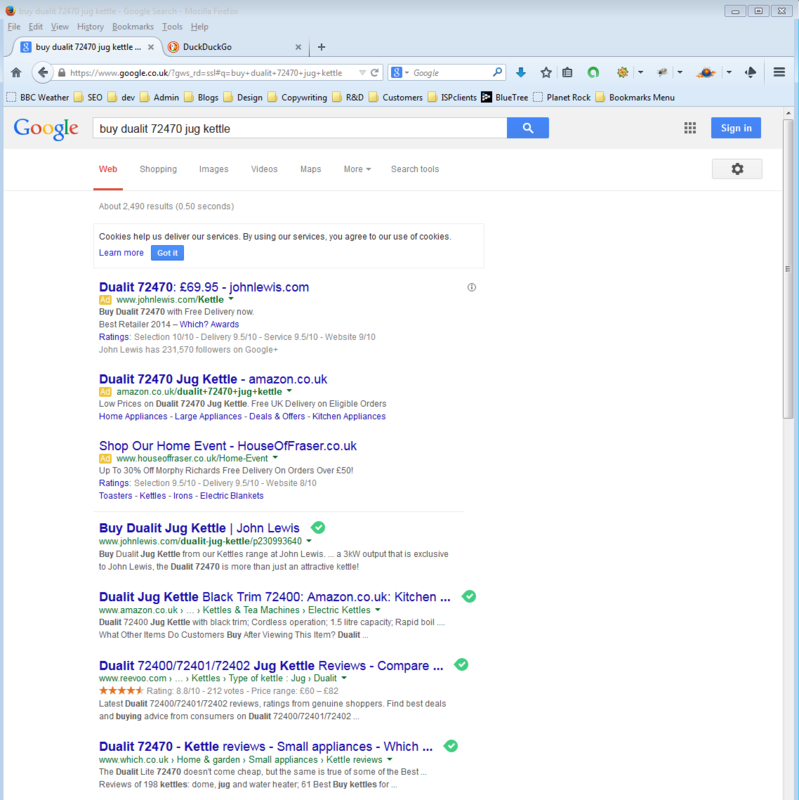 This entry was posted in Wider Internet Issues and tagged duckduckgo, google, internet safety, private browsing, Search on September 23, 2014 by Dave Fielden. On Monday, I was looking for a local business which I know, so I searched for what they do. Does anybody use Yell or BT.com any more? They didn’t appear in my search results. So, thinking this might turn out to be an SEO sales opportunity;-) I searched for it by business name, specifically. Bing listed them this time, but when I clicked the link to open their website, this note appeared next to the search results. Bing would not take me straight to their website. Google, similarly, listed them but with this immediate and scary warning, “This site may harm your computer.” One click fewer than Bing, you notice. If you go straight to an infected website, your browser will warn you very clearly not to open it, too. If you decide to visit, be prepared to get rid of some spam! This is all very upsetting for web user and site owner alike. Hackers, the source of malware, seek out weak targets. Everyone is vulnerable. Think of your website like your house: how do you reduce the risk of burglary? You make your house less attractive to burglars than those around it. You buy a house in an area with a low crime rate. You fit decent locks and security lights. You fence the garden, install robust, lockable gates, and plant thorny bushes in vulnerable places. And then you take out insurance so that, should the worst happen, you can replace what you’ve lost. Take regular back-ups – and test them – so you can get back up and running fast if disaster strikes. And keep constantly vigilant: add regular website audits into your Business Continuity Plan. Here’s some more information about malware attacks. This entry was posted in Website design and usability and tagged anti-spam, back-up, google, hacker, malware on August 2, 2012 by Mark Fielden. Rapid growth means Portishead is filling up with business people. With young families and demanding jobs, they tend to be cash rich and time poor. When such people want something, Google is probably their first port of call. They may well search using a mobile phone or tablet. Tablets are becoming more popular with businesses. 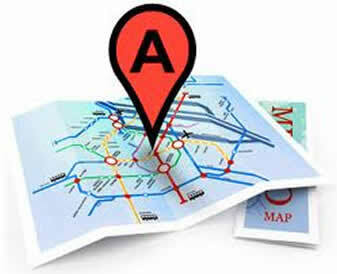 These devices announce their location to search engines, which list local results higher, when appropriate. 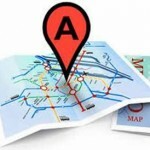 With Google Places you can promote your business using a free web page. It doesn’t take very long and it’s easy to make your business stand out from the crowd. state your opening hours and payment options. More important, you can choose the categories in which your business will be listed. Google will list your business whenever someone searches for them around your location. It’s dead easy: go to the Google Places home page and log in using any Google account. If you don’t have one, we’ve more advice here. This entry was posted in Digital Marketing and tagged google, Google Places, iPad, mobile phone, portishead on May 24, 2012 by Dave Fielden.